Over the years, our team at Boerne Air Conditioning Experts has learned the important of regular care and cleaning of the air ducts in your home. Your air ducts provide the essential function of circulating air from your heating and cooling systems into and out of each room in your home, which allows for consistent interior comfort regardless of outside temperatures and seasonal changes. All of the air in your home circulates throughout your air ducts multiple times a day, and that same air cycling through your air ducts is the same air that fills your living spaces. To ensure that this air is as clean as possible, air duct cleaning can remove all the traces of dust and contaminants from your ductwork. This includes the supply and return air ducts as well as the registers and diffusers in each room. Throughout the cleaning process, power vacuums are used to eliminate all dust and debris, preventing it from re-circulating throughout your home. Our staff at Boerne Air Conditioning Experts is happy to take on the task of cleaning the air ducts in your home, and we’re all happy to share the many benefits of air duct cleaning. Along with the obvious benefit of suppling cleaner air throughout your home, air duct cleaning also creates an overall cleaner living environment. After having your air ducts professionally cleaned, you’ll see a reduced amount of dust in your living space, which would otherwise be landing on your furniture, on your bedding, or on the floor. 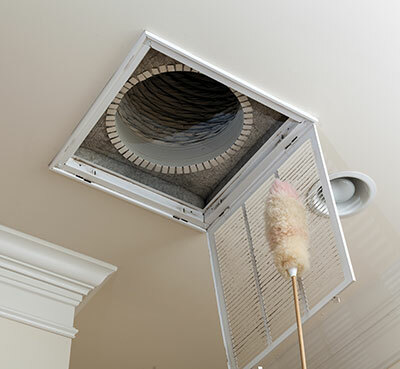 Air duct cleaning also reduces the amount of interior cleaning and dusting necessary to maintain a safe, hygienic home. 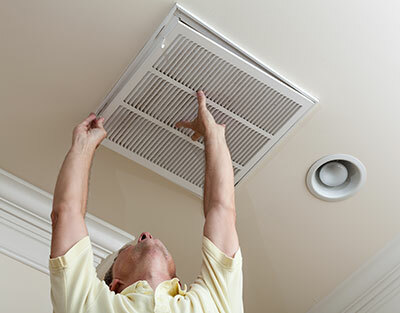 ​Additionally, air duct cleaning decreases the amount of allergens and irritants in your air. Your air ducts frequently contain harmful a handful of different contaminants and microorganisms, including everything from pet dander, bacteria, pollen, mildew, mold, and other toxins. Those who suffer from indoor and outdoor allergies, asthma, and other respiratory issues will be particularly sensitive to these contaminants. Regardless of whether or not someone in your home suffers from chronic allergies or respiratory problems, air duct cleaning contributes to healthier and easier breathing for all living in your home. Another benefit of air duct cleaning includes the removal or unpleasant odors or smells circulating your residence. Pets, household cleaning products, paint fumes, mold, tobacco use, and even food preparation can all contribute to stale smells in your air ducts. Each time your furnace or air conditioner is running, these odors will repeatedly flow throughout your house. A detailed cleaning can help to remove these odor-trapping particles, resulting in a fresher smelling home. Finally, air duct cleaning also results in improved airflow efficiency. Buildups of dust and grime can cause your systems to work harder to cool or heat your home, decreasing the level of efficiency of these systems. A clean system will operate at prime efficiency and provide the most cost effective performance. To learn more about additional benefits of air duct cleaning, or to schedule one of our team members to stop by your home for an inspection, feel free to contact Boerne Air Conditioning Experts.